You get to a bus stop or MAX platform and look up at the screen to see when the next bus or train will arrive. But those digital information displays provide more than the convenience of TransitTracker at a glance; they help us communicate with you. And soon you’ll be seeing more of them on the MAX system. Leveraging federal funds, TriMet will be adding dozens of new screens to platforms beginning this month, one of the targeted investments we’re making for our riders. 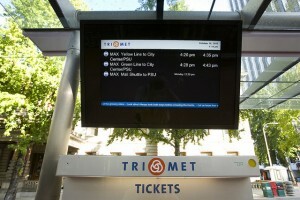 “The digital displays provide useful real-time, TransitTracker arrival information, but even more important, they give us the opportunity to share service information about delays, disruptions and emergencies with our riders in a more timely and efficient manner,” said TriMet General Manager Neil McFarlane. Thanks in part to an $180,000 grant from the Federal Transit Administration, 58 new screens will be installed at MAX platforms during the next year and a half. This will bring the number of digital flat screens and reader boards throughout the TriMet system to 262. The new flat screens will go up at various MAX stations, mainly on outlying sections of the Blue and Red lines. Most of the first ones installed this summer will be on the west section of the Blue Line between the Tuality Hospital/SE 8th Station and the Beaverton Transit Center. Others are set to be installed this fall on the east side between E 102nd Ave Station and the Gresham Central Transit Center. All Green and Yellow MAX stations already have digital information displays – either the flat screens or reader boards, although due to repeated vandalism signs at the SE Powell Blvd and SE Flavel Blvd stations have been temporarily removed. Learn more about the vandalism and the reward offered in the case. “Adding these digital information displays to our MAX stations allows TriMet to deliver a better customer experience by having the ability to deliver timely, accurate and useful service information to our riders waiting for their trains.” said Drew Blevins, TriMet’s director of marketing and customer information services. The flat screen display equipment costs about $8,000 per unit, with each reader board costing around $5,000. Installation averages $3,000, but varies depending on location. TriMet will use general funds from the Fiscal Year 2013 and 2014 budgets to cover the installation of the new signs. Four additional digital display screens will be going up at bus stops in the Lloyd District. The Lloyd District Transportation Management Association (LTMA) purchased the signs. The LTMA also purchased eight others that went up at bus stops and the NE 7th Ave MAX platforms in the district in 2010. Those bus stop displays run off a wireless connection, and coverage along Holladay Street was spotty at best. Recently, TriMet changed wireless carriers for the displays and thanks to a new 4G network as well as new modems and antennae installed by our maintenance technicians, the displays are up and running. So how do the digital displays work? The digital information displays run on their own network, displaying the same arrival information used for all TransitTracker modes – online, by phone and by text as well as via third-party applications. TriMet can also post service and other information that goes into a server and is fed into the signs. We do see issues with individual displays come and go. These are computerized devices, and like personal computers and electronics, they may experience software, hardware or – as with what we saw in the Lloyd District – connection problems. Some issues may take longer to fix than others. For instance a screen at SW 6th and Main Street in downtown Portland was stuck on the first scheduled bus arrivals of the day for weeks. Several attempted repairs and reboots later, we determined the motherboard needed to be replaced. Overall, our technicians have found that solid state drives are more reliable than hard drives in displays. Solid state drives have no moving parts where hard drives do. While wireless service for your personal smartphone and electronic devices makes life easier, that’s not the case with our display screens. Hard connections, such as fiber lines, keep the signs working more consistently than wireless. Wireless connections also limit the ability to feature graphics or video on the flat screen displays. Why is the TransitTracker time different on my app? The temperature fluctuations we experience here in the Pacific Northwest are not a problem. The screen of a flat screen display is essentially just like your standard computer monitor or flat screen television. The case the screen is built into is another story. In addition to the CPU in each, the case contains technological equipment that maintains consistent and correct temperature internally, in both summer and winter, so the cold and heat aren’t problems. There is also tamper-resistant glass in the case to protect the actual display screen from vandals and is less expensive and easier to replace than the digital information display itself. Still a quick fix isn’t always possible. Some issues may be solved with a remote software command, but others need someone to visit the sign and reboot it. Other problems may be tied to equipment and a new part or parts may be needed. So if you encounter a display that’s not working, grab your phone and get TransitTracker information online, with an app or through 503238-RIDE. And, while you’re at it, can you please send us a quick email to let us know the display at your stop is down? Just email us at TransitTracker@trimet.org, and we’ll make sure it is on our list of priorities.